The suicide rate in Kerala has declined for the last two years. Kerala,once indicated top rate in suicides shows gradual downward trend.Now,Kerala’s position in suicide is 8th (21.6).This data, issued by Dr.P.N.Suresh Kumar, consultant psychiatrist and chairman Thanal Suicide Prevention Center,Kozhikode ,shows signs of relief for Kerala. Puducherry(43.2) , Sikkim (37.5), Andaman and nicobar (28.9), Thelungana and Chattisgarh (27.7), Dadar and Nagar Haveli (25.4) etc. These are signs of relief for Kerala for which the credit goes to Kerala’s health\ economic\ religious \ media’s combined activities. The suicide rate of Kerala in 2015 in lakhs is 21.2 that is, 7692 people committed suicide in 2015. It was 3646 in 2014 that is, lesser by 54 people. National Crime Record Bureau reports show that out of complete Kerala’s suicide rates, 24.1% happen due to mental\ physical illness and 36.5% happen due to family crisis. In the last 10 years the suicides due to family crisis have declined massively. In a year 75% of suicides are committed by men. Among these, 50% of suicides are committed by youngsters between the age of 15 and 45. The men expected to be the backbone of the family are lost through these suicides. In contrast of foreign countries, yet another fact is that, 75% of suicides are committed by people who are married. Marriage being a relief from such suicidal thoughts, it is to be studied deeply how Kerala is facing an increased rate of suicides among married people. When researched on the suicide rates , maximum suicides occur due to family crisis (36.5). The more number of suicides by family members increases the connection between family crisis and suicide rates. In short, marriage itself is turning into a suicidal activity. In spite of this a number of people commit suicide due to mental \ physical illness. The method of suicide also changed,according to the research; poisoning is decreasing and hanging is increasing with the course of time. The one on one interrelated reasons lead a human mind towards suicide. The destruction of families, incurable mental\ physical diseases, addiction to drugs, actions undertaken without a second thought, accessibility to suicidal weapons, the importance given to suicides by different media etc. increase the chances of suicides. A suicide gives more pain to the family and close friends than a natural death. Giving an unbiased advise or conversation with a person with struggling suicidal thoughts can result in a huge relief to that person. World Health Organization and International Association for Suicide Prevention together observe September 10th as World Suicide Prevention Day, every year. 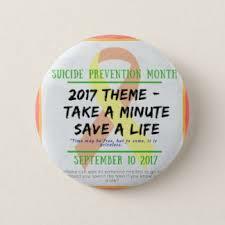 This year the message for this day is “Take a minute, save a life”. This day intends to make people aware about such suicidal issues and prevent their untimely deaths. According to the World Health Organization, about 1 crore people commit suicide per year, worldwide. That is, every minute at least 2 suicides occur in this world. Another fact is that, when one suicide occurs, at least 20 suicide attempts occur in the world. 1,34,623 people committed suicide in India in 2015. It is hard to find a suitable reason which justifies such a fatal activity . Different people might have different reasons. Mental, genetic, physical, economic,and environmental facts are held responsible for people committing suicide. How tough circumstances lead people to suicide, And how some others are able to conquer it, is a tough fact to find reasons for. Whatever the reasons are, suicides are stoppable. Suicides and suicide attempts are representative of the fact that a person feels isolated in the society, depressed, and has no reason to live. Sadly such representatives go unnoticed by people and the society. A person who wants to die and at the same time wants to live, suicide attempts are calls for help by them to survive. When a person finds himself\ herself in a crucial situation when there is no other way to take another decision in their life, he\she commits suicide. If the person is given mental peace at the right time, then he\ she can be saved from such suicidal thoughts. This News was posted on Friday, September 8th, 2017 at 3:34 pm and is filed under City Talk.